ONE Friday evening, a few weeks ago, an important public meeting took place concerning the planned closure of beds on the in-patient ward at Canterbury’s Pilgrims Hospice. 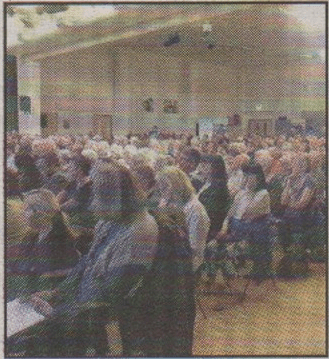 An estimated 500 people attended and in spite of our MP Julian Brazier chairing the meeting and the presence of many important figures it concluded with an extraordinary event: trust chairman Dr Richard Morey confirmed to a questioner that the meeting was a “presentation” rather than a “consultation” — and a mass public walkout followed. I welcomed the fact that so many people with firm opinions on an issue that was so important to them should have expressed their views in such an eloquent way and in the spirit of peaceful protest. Non-violent direct action protest has a long history in demonstrating opposition to the unwelcome activities of political, industrial or other organisations and follows the tradition of the Quakers who opposed both Cromwell’s Puritan government and the restored monarchy of Charles II over a number of issues, and in various peaceful ways. The Quakers refused to pay tithes to the state church, to take oaths in court, to practice ‘hat honour’ (doffing their hats to the king or others in positions of power) or to go to war — their belief being that those who peacefully object can bring to the attention of many the “harm” brought about by the few. Martin Luther King further clarified that the “resister” does not seek to defeat or to humiliate the “opponent” and, “the end is never merely to protest but the end is reconciliation.” Although the walkout at the meeting would seem to have been spontaneous, the outcome has indeed been one of reconciliation as the trustees have agreed to keep the beds open. Julian Brazier rightly pointed out that “shifting resources from hospice beds to outreach will not command public support for fundraising,” a crucial fact that one might have thought the trustees hardly needed reminding of, though they clearly did, and now thankfully seem to have recognised. Lib Dem Cllr James Flanagan, whose own ward is where the hospice is based, wrote how he hoped that “the public’s views would be taken into account and those of medical professionals such as Dr Terry Stefani” — the latter having set out in a letter to the Times why he believed the hospice beds must stay. For my own part, the heartbreaking letter to the Times from Mrs Wallace-Cunningham (Hospice is such vital support for families, June 4) was the most moving testament, reminding me of how, as an only child, I suffered the trauma of both my parents dying from terminal cancer and how grateful I would have been if they had been able to spend their last days at a hospice like the Pilgrims where a much-loved friend had been cared for so well until her death. The dictionary definition of a hospice is ‘a home providing care for the sick or terminally ill.’ Long may the Pilgrims Hospices remain as such, thanks to all those who spoke up so powerfully, and the trustees who finally listened.